The best banana bread. Really. I hate to talk trash, but my banana bread is the best in the world. Really. 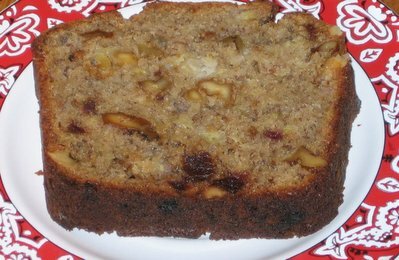 Now, you may be thinking, "Hey, MY banana bread is pretty damned good!" And I'm sure it is. It may be an excellent banana bread, but since mine is, objectively speaking, the best possible banana bread, it only stands to reason that all other banana breads are, tragically, inferior. But have no fear! In the spirit of holiday generosity, I am willing to share my banana bread recipe with you, and then you too can brag safe in the knowledge that your claims are backed up with absolute, verifiable truth. Mix together butter, banana, eggs, and extracts. (Do yourself a favor and just mix them in the saucepan you used to melt the butter.) Sift together the dry ingredients in a large bowl, then fold the wet ingredients in. Do not overmix. Add the dates and nuts when you can still see big streaks of flour, to avoid overmixing. Bake in a buttered loaf pan in a 350 degree oven until done, about an hour. *I have no idea how "natural" Frontier Natural Walnut Flavoring is. It's probably walnut shells infused in petroleum, with maybe some ground walrus tusks. I don't know. I don't care. I love this stuff. It gives a subtle nutty flavoring throughout a bread or muffin or cookie. I add it to anything baked that includes nuts. If the company ever goes out of business, I will buy up a case. I decided to look around my local supermarket to see what I could find that was New England grown. 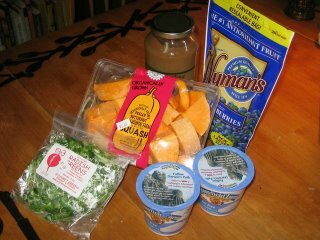 Even in the dead of winter, I was able to find a few things: Wyman frozen wild blueberries, radish sprouts grown in Vermont, Stonyfield Farms yogurt, local applesauce, and even some butternut squash. I also could have bought local butter and milk, mushrooms grown in Connecticut, lots of local cheese, maple syrup and honey. 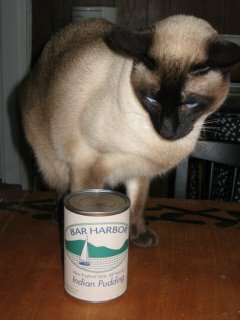 I also know some supermarkets, though not this one, carry A-1 dried beans "State of Maine" label, which are Maine-grown. Not exactly enough to live on, but more than I expected. Where have I been? You might well ask; I haven't posted in almost two weeks. Unfortunately, I haven't been, say, on a trip to Paris. I've just been here, nursing a serious case of the holiday blues. So the post of all the baking I did over Christmas? There won't be one. Because I didn't. For the first year in recent memory, I didn't bake cookies for my co-workers; I didn't make marmalade or jam for gift baskets; I didn't get together with my best friend to make candies; I didn't make a Yule log. I bowed out of Christmas this year. Partly because I have a touch of SAD. Partly because I'm starting school in a month and I'm nervous about it. Partly because I wasn't looking forward to this Christmas. My whole family got together for Thanksgiving: my sister from Albany with her husband and three kids, my brother from Montreal with his best buddy from college, my other single sister who lives near here, and my parents. There were two types of stuffing, the turkey of course, a multitude of vegetables, and a full dessert table. With the whole family there, it seemed worthwhile to spend days ahead prepping for the big event. But my brother wasn't coming for Christmas, nor my married sister and her family. Christmas this year was my parents, my sister and me. My mom and her two spinster daughters. God help us all. It was a small Christmas. But it wasn't just that that kept me from having the Christmas spirit. I love my parents. But I don't exactly get along with them very well. We don't fight, but we aren't close either. So holidays that consist of just them and me and sis; well, they're not fun. We spend a lot of time skirting nervously any topics on which our differences of opinion might become obvious - politics, religion, culture, television, and, yes, since this is a food blog, I might as well talk about it: food. Food is a much more loaded topic than we usually consider it to be. I mean, if you're stuck with a group of people you don't know, talking about food seems a pretty safe bet. You can talk to almost anyone about which are the best ice cream parlors in your city, or where to find great pizza, or what your family always has for Christmas Eve dinner. But we define ourselves by what we eat, and we read meaning into other people's choices as well. When I bring my grass-fed organic beef to my parent's house to roast for Christmas dinner, I am bringing my own associations - connections to local farmers, traditional British Christmas feasts of roast and Yorkshire pudding, festive holiday indulgence in fine food. But I also carry associations I don't intend: snobbery, rejection of the turkey dinners of my childhood, prodigal extravagance. And when my mother puts her grocery-store whoopie pies on the dessert table, she intends to show indulgence, a bit of holiday frivolity, and what do I see? Transfats, preservatives, and a greasy mouthfeel. We're not terrible people. We take each other's offering in the spirit in which it is intended: my mother praises the roast, I eat a Whoopie pie and reminisce about my brother's fondness for them when he was a child. But we notice the gap between us, the lack of connection where it seems like connection should be easiest, the effort we are each making shows, and it seems to sadden us both. Simple matters of taste resound with significance, even when they shouldn't. If you don't believe, try a simple experiment. Ask someone what sort of person they would imagine would order the following flavors of ice cream: vanilla, dark chocolate, hazelnut, chai, Grapenuts. I'm guessing the answers will go something like this, depending on the respondents' own preferences : dependable (boring), sensual (dramatic, self-indulgent), sophisticated (pretentious), edgy (ostentatious), old-fashioned (old). Now, these sort of judgments are the type of thing maturity should get us beyond. I can't tell anything about the sort of person you are from whether you prefer venison or chicken, and I'm not going to start ordering chai ice cream when I really want chocolate chip just so I won't feel boring. These differences are shallow, and food-lovers are the worst offenders when it comes to putting too much weight on them. Taste-preferences are meaningless. But taste isn't the only way we define ourselves by food. There are also ethnic connections, restaurant vs. homecooked, fancy bakery versus supermarket, and so on. Most of these are as frivolous as ice-cream choices - people who love Italian food are not more in touch with their feelings than people who would rather corned beef and potatoes. But some differences do have more significance. Organic food matters to me because I believe we are poisoning our planet with pesticides. Sustainable food matters to me because I believe that organic isn't enough to ensure a healthy environmental future. Local food matters to me because I believe it helps to support community, the environment and the local economy. Pastured meat matters to me because I believe it is morally wrong to confine animals for the whole of their lives and because I believe that grass-fed meat feeds our bodies better than grain-fed meat. These are moral beliefs, things that get to the core of what I care about: finding a healing way to live in a society that is, in my mind, very ill. This point of view is so far from my parent's as to be completely alien. I am not judging them in this. Their generation (they turn 70 this year) was not raised to think about consumer choices as moral choices. There is only one virtue they understand in regards to purchases, and that is frugality. Morality, to them, is primarily a question of being honest, being chaste if unmarried, and having faith. My parents are very good people - they give to the poor, my mother visits shut-ins, my father volunteers his services at a nursing home. I am in no way as generous with my time as they are. They do service work that I admire greatly. They would consider the idea of doing good by spending money on oneself to be absurdly frivolous. And they would be right. I make no sacrifice in buying fantastic beef. I get enormous pleasure out of going to farmers' markets. I don't want to be the holier-than-thou Whole Foods customer: given the price of much organic food, being able to buy it is a sign of a financial security many can only dream of having. And yet, and yet....I still believe that Big Agriculture, factory farms, and junk food harm not just the bodies, but the soul of my country. I have stopped trying to communicate this idea to my family; they can't help but understand my interest in these foods in terms they can understand, and unfortunately in those terms local, sustainably-grown food is simply overpriced, a personal indulgence that hints at fiscal irresponsibility (a sin mostly ignored in our credit-card-mad days, but one that is nonetheless at the heart of much misery in this world). If this attitude were a personal quirk of my parents, this blog entry would simply be its own display of personal indulgence, just me trying to work out the issues between myself and my family in a public forum. And, um, well, it probably is just that. And I should probably be embarrassed. But I know that my parents are more like most Americans than I am. In many ways, this is the defining problem of the sustainable food movement: how do we convince people that sustainable agriculture is a necessity, not a luxury? I don't really know how. Okay, I've come a long way from my Christmas blues. I don't want to leave anyone with the impression that my views on sustainable farming ruined my Christmas, because that would be completely skewed. But you start thinking about one thing, and it leads to another...As for the other issues...well, let's just say the War on Christmas found its way to our festivities this year, and there were representatives of both armies. Sigh. Had enough of my personal issues? Good, me too. The rib roast was fantastic, particularly the gravy, which I made from red wine, pan drippings, onions and roux. The Yorkshire pudding puffed less than usual (pan not hot enough? ), but was still crisp on the outside and soft on the inside. I did make two batches of cookies: chewy walnut for my nut-loving mother, and snickerdoodles for my sister. The food was good. Even the Whoopie pies. And now I'm home. I've got beef stock simmering on the stove, which soothes me to no end. Tomorrow, my boyfriend will get home form his mother's. We'll eat soup and salad and a pasta with nice ragu sauce. And I'll have lived through another Christmas. God bless us every one. Cooking the tongue was easy; so was peeling it. The outer skin came off in a stiff thick sheet, like pulling the wax off a wheel of cheddar. Inside, the tongue looked pink and vulnerable and, frankly, just as disturbing as it did when it was blue and bumpy. 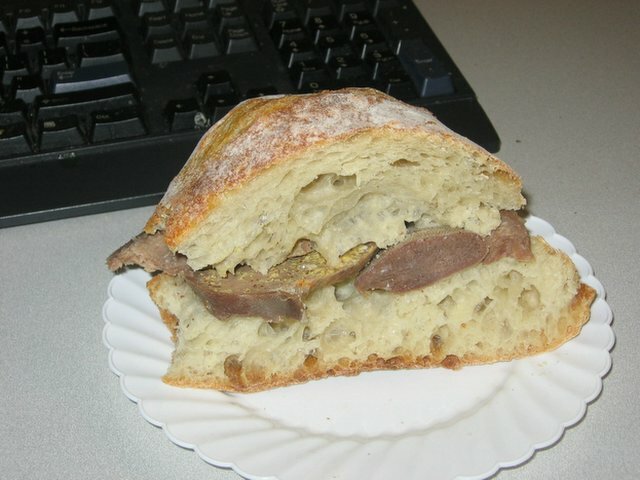 My boyfriend and I tried it while it was still warm, and you can see that today I've got a tongue sandwich for lunch. The overall verdict was that it was pretty good. The texture is a bit tougher than I would like, ideally, but the flavor is good, like a cross between corned beef and liver. I can't imagine making a special search for it or anything, but it made a nice sandwich today, and I'm going to try making some hash with it tonight. In response to some of the comments about local eating: I know that most people in the lcaol eating movement define "local"
as within 100 miles of your home, but I'm a bit more generous. I would say within about 300 miles. That's an easy day's drive, and in my case happens to roughly outline New England (with the exception of Northern Maine), so there are cultural reasons to define local that way as well. Like so many things, "local" and "non-local" are not two distinct categories, but a range. It's only sensible to choose truly local produce - no need to go more than a few towns over for me to get greens, strawberries, and tomatoes. But apples and cider, seafood and meat might require a bit longer drive, and grains might reasonably be considered "local" if they are grown in Northern Vermont rather than in the Midwest. Considering that most food in the U.S. travels 1,500 miles before it hits the plate, 300 miles is pretty good. Also, if I ever really were to do the local eating experiment, I would allow myself one exemption: a box of spices. I figure that given the relatively low weight/volume of a year's worth of spices and the enormous culinary advantages of the same, along with the fact that it would be impossible to grow vanilla, cinnamon, cardamom, nutmeg or black pepper in my area, spices are a reasonable exception to the local-eating rule. I would give myself no exemption for herbs, because those are easily available locally. And no exemption for chocolate, coffee, citrus, or liquor, tragically. All of which may keep me from ever actually taking on such a crazy project. But if you would like to read about some people who did, click here. That, my friends, is the tongue of a cow. It's in my refrigerator at this moment, where it has been for the past week, bathing in a brine of salt water, sugar and spices. Tonight, I will simmer it for 3 hours on the stovetop in water with onions and carrots and bay, and when it is cooked, I will skin it. And maybe then it won't look so goddamned nasty. I've never cooked tongue before. Heck, I've never eaten tongue before (it's impossible to write about this without sounding obscene.) My boyfriend, who has, claims it taste a bit like ham, with the density of liver. We'll see. In the meantime, I'm amazed by how very creepy I find it. Generally, I don't get bothered by foods. I can throw a calf-hoof into the braising liquid of my French-style pot roast without a qualm. Lobsters I murder without a twinge of conscience. I love slurping oysters. I yearn for a source for organic chicken feet to improve my stock. I'm sure it will look better once it's cooked. It had better taste good. It's officially winter now. The first real snow is coming down outside, and all I can think about is farm-fresh vegetables. It's hard to eat locally in New England in December. Hard, but not impossible. I've been thinking more and more about what it would take to eat completely locally for, say, one year. Various people in the eat-local movement have done this. Many of them are, admittedly, located in much warmer and more hospitable places, but some are not. I have the first and could easily manage the second, but I don't have the third or fourth and likely won't for another two years or so. But with all four, I think it would be possible. In the summer, of course, there would be no problem with vegetables and fruits. In the winter, I could still have root-cellared potatoes, sweet potatoes, parsnips, beets, carrot, cabbage, winter squash, celery, collards, apples and pears; frozen green beans, peas, corn, broccoli, blueberries and peaches; various pickles and relishes; and dried and canned tomatoes, assuming I start in the summer and plan ahead. Local meat is easy to come by, of course, and local dairy is available at the regular grocery store. There are quite a few local producers of cider, which I prefer to beer, so that's no sacrifice. There are some local wines, though the quality of most is questionable. There are some providers of local mushrooms, or I could grow my own. There's even local sea salt. Sugar would be a problem. I am sure it would be good for my health to replace all the white sugar in my diet with local honey and maple syrup, but it wouldn't be easy. I have been able to find no commerical growers of nuts in New England, so I couldn't even make maple walnut ice cream. I haven't been able to hunt down many producers of local grains. Gray's Grist Mill grows and grinds Rhode Island flint corn, the proper basis for jonnycakes. Littleton Grist Mill stone-grinds organic grain, some of which comes from Vermont, but the rest supplied from South Dakota. There is a farmer in Aroostock County who is growing grain for a Maine bakery (interesting article here) who could perhaps be persuaded to sell some grain to an idealistic blogger, although Northern Maine is pushing the outer boundaries of "local." Anyway, it would be an interesting project, but not really possible for me at the moment. Until it is, however, I intend to try to deepen my commitment to local food. Rather than just eating the food I normally would, but trying to find local versions, I want to make an effort to choose local foods whenever possible and plan my meals accordingly. So instead of picking up wine for dinner, I'll buy cider and enjoy what was once the most popular drink in New England. I'll try to use more maple syrup and honey and less white sugar. I'll buy smoked seafood as a treat, rather than pate. I'll order some of that cornmeal and eat more cornbread and less rolls. Maybe I should make this an early New Year's resolution. Oh, and there are new links up for local farmers' markets, maple syrup, honey, and specialty food providers. I'm working on lists of farms and CSA programs, but obviously that's a much bigger project and is going to take a while. I'm going to be adding a whole bunch of new links to the sidebar. I've started today with the "Big Local Links," the most basically useful websites for finding local food sources. All are national, except for the Federation of Massachusetts Farmers' Markets. Next I hope to pull together a list of New England food providers, then a list of blogs on sustainable agriculture and the local food movement. If anyone can suggest any additions, let me know. Trying to achieve a diet of primarily locally and sustainably grown food is difficult; I believe we need all the resources we can get. At some point I promise I will actually cook something interesting again and post about it. Really. Hard cider - I've had some of this company's cider, and there are some good ones. Others I haven't liked as much. Depends on how sweet and how bubbly you like your cider. Blueberry wine – don’t knock it 'til you try it. I've had the oak dry, and it's really very good. Local honey and maple syrup are widely available. All of the above are New-England-made and New-England-grown. There are also lots of New-England-made food products created from ingredients that are grown elsewhere (like sugar). You might also consider buying gifts that allow people to grow or make their own food. I've bought one friend a mushroom-growing kit from Fungi Perfecti, and my boyfriend will be getting a kit for making beer at home. This week I've had a rather nasty sore throat. I've been craving hot oatmeal, scrambled eggs, herb teas - anything hot that will slide on down soothingly. So, for the first time ever, I bought a can of Indian pudding. My sole experience with Indian pudding came when i was around nine or ten. My family had gone to Durgin Park for dinner, so it must have been some sort of important occasion. Not that Durgin Park is particularly fancy, just that there were four children in my family, so restaurants with non-plastic utensils were reserved for events. For those of you who don't know, Durgin Park is an old New England institution, renowned for its rude waitresses and its Yankee specialities like clam chowder and Indian pudding. I was the sort of child who considered everything old-fashioned to be vaguely romantic, so I ordered Indian pudding for dessert. My mother warned me that I might not like it, but I was convinced it had to be good - how bad could dessert be? And it was some sort of pudding, for Pete's sake! Oh, how wrong I was. 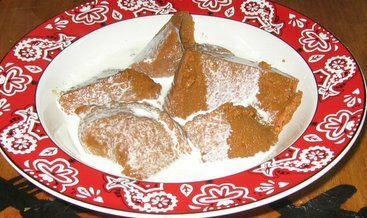 Indian pudding is cornmeal mush flavored with molasses and gingerbread spices. I had basically ordered polenta for dessert, and my young suburban tastebuds were in no way prepared for that concept. I was horrified and barely touched my pudding. I figured enough years had passed that I might have come around on the Indian pudding thing, and I was right. I can't imagine eating it cold, but warmed up, with a little cold cream poured over, it was a nice treat. It was also locally-made, though I doubt that any of the ingredients were locally-grown. All of the ingredients were also recognizable as food - essentially cornmeal, molasses, spices, milk - which is always a plus.